Kevin Warwick | "I feel that we are all philosophers, and that those who describe themselves as a ‘philosopher’ simply do not have a day job to go to." 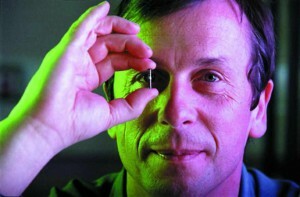 Kevin Warwick is Emeritus Professor at Coventry and Reading Universities. Prior to that he was Deputy Vice-Chancellor (Research) at Coventry University. His research areas are artificial intelligence, control, robotics and biomedical engineering. He is a Chartered Engineer (CEng.) and is a Fellow of The Institution of Engineering & Technology (FIET). He is the youngest person ever to become a Fellow of the City & Guilds of London Institute (FCGI). He is the author or co-author of more than 600 research papers and has written or edited 27 books (three for general readership), as well as numerous magazine and newspaper articles on scientific and general subjects. He has broadcast and lectured widely and holds various visiting professorships.Kevin was born in Coventry and left school to join British Telecom, at the age of 16. At 22 he took his first degree at Aston University, followed by a PhD and a research post at Imperial College, London. He subsequently held positions at Oxford, Newcastle, Warwick and Reading universities before being offered the DVC post at Coventry. He has been awarded higher doctorates (DScs) by Imperial College and the Czech Academy of Sciences, Prague on different scientific areas. He was presented with The Future of Health Technology Award at MIT (USA), was made an Honorary Member of the Academy of Sciences, St.Petersburg, was awarded the IEE Senior Achievement Medal in 2004, the Mountbatten Medal in 2008, the Ellison-Cliffe Medal in 2011 from the Royal Society of Medicine and in 2014 was elected as a member of the European Academy of Sciences and Arts. In 2000 Kevin presented the Royal Institution Christmas Lectures, entitled “The Rise of The Robots”. He has also been awarded Honorary DSc Degrees by the Universities of Aston, Coventry, Bradford, Bedfordshire, Portsmouth and Kingston and an Honorary DTech Degree by Robert Gordon University. Kevin instigated a series of pioneering experiments involving the neuro-surgical implantation of a device (Utah Array/BrainGate) into the median nerves of his left arm in order to link his nervous system directly to a computer to assess the latest technology for use with the disabled. The development of the implant technology was carried out by a team of researchers headed by Dr Mark Gasson who, along with Kevin, used it to perform the ground-breaking research. Kevin was successful with the first extra-sensory (ultrasonic) input for a human and with the first purely electronic communication experiment between the nervous systems of two humans. His research has been discussed by the US White House Presidential Council on BioEthics, The European Commission and led to him being widely referenced and featured in academic circles as well as appearing as cover stories in several magazines – e.g. Wired (USA), The Week (India). The Institute of Physics selected Kevin as one of only 7 eminent scientists to illustrate the ethical impact their scientific work can have: the others being Galileo, Einstein, Curie, Nobel, Oppenheimer and Rotblat. His work is used as material in several advanced Level Physics courses in the UK and in many University courses including Harvard, Stanford, MIT & Tokyo. His implants are on display in the Science Museums in London and Naples. As a result, Kevin regularly gives invited Keynote presentations. Kevin’s research has involved robotics and he was responsible (with Dr Jim Wyatt) for Cybot, a robot exported around the world as part of a magazine “Real Robots” – this resulted in royalties totalling over £1M for Reading University. Robots designed and constructed by Kevin’s group (Dr Ian Kelly, Dr Ben Hutt) were on permanent interactive display in the Science Museums in London, Birmingham and Linz. Some of Kevin’s recent research involves a collaborative project with the Oxford neurosurgeon, Prof. Tipu Aziz, using intelligent computer methods to predict the onset of Parkinsonian tremors such that they can be stopped by means of a deep brain implant. This work was hailed in the Mail on Sunday as “the most significant recent advance in biomedical engineering”. He also led an EPSRC sponsored project in which a cultured neural network (using biological neurons) was trained to control a mobile robot platform. This work, which was reported on in a New Scientist feature article, is now being used as an exercise for high school science studies in the UK. A Youtube video of this research has been downloaded/viewed 1.9 million times. His presentations include The 1998 Robert Boyle Memorial Lecture at Oxford University, The 2000 Royal Institution Christmas Lectures, The 2001 Higginson Lecture at Durham University, The 2003 Royal Academy of Engineering/Royal Society of Edinburgh Joint lecture in Edinburgh, The 2004 Woolmer Lecture at York University, the 2005 Einstein Lecture in Potsdam, Germany and the 2006 IMechE Mechatronics Prestige Lecture in London.The Annual Science Faculty lecture at University of Leicester in 2007. In 2008 the Leslie Oliver Oration at Queen’s Hospital and the Katholieke Universiteit Leuven, guest lecture “Four weddings and a Funeral” for the Microsoft Research Chair. In 2009, Cardiff University, 125th Anniversary Lecture. In 2010 he launched the new Research Institute for Innovation Design and Sustainability at Robert Gordon University and gave the Ellison-Cliffe Lecture at the Royal Society of Medicine in 2011. In 2012 he presented the IET Pinkerton Lecture in Bangalore. Kevin was a member of the 2001 HEFCE (unit 29) panel on Electrical & Electronic Engineering, was Deputy Chairman for the same panel in the 2007/8 exercise and is a member of the EPSRC Peer College. He also received the EPSRC Millenium Award (2000) for his schools robot league project. Kevin’s research has featured in many TV and film documentaries, e.g. Inventions that changed the world (BBC2), Late Night with Conan O’Brien (NBC), Future Scope (RAI 1) and The Making of I Robot (Twentieth Century Fox/Channel 5). He has appeared 5 times in Time magazine and was selected by Channel 4 as one of the Top 6 UK Scientists for their 2001 series “Living Science”. In 2002 he was chosen by the IEE as one of the top 10 UK Electrical Engineers. Kevin’s research is frequently referred to by other authors – recent examples being in books by Robert Winston, Peter Cochrane, Jeremy Clarkson and Susan Greenfield. Kevin’s implant research was selected by National Geographic International for a 1 hour documentary, entitled “I,Human” screened in 2007 – this was broadcast in 143 countries and translated into 23 different languages. Some of his TV appearances are logged on the imdb website.